The Phillies claimed Ezequiel Carrera off waivers on Tuesday afternoon and designated Rule 5 pick Ender Inciarte for assignment. Carrera, 25, hit .272 in 48 games with the Cleveland Indians last year. The outfielder brings speed and can play in both left and center, but has no power. 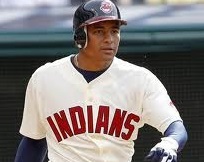 He was designated for assignment by the Indians last week to make room for Jason Giambi on the club's 40-man roster. Over the past two seasons Carrera has a slash of .255/.306/.347 with 14 doubles, six triples, and a pair of home runs. Inciarte, a Rule 5 pick, performed well for the Phillies during spring training and earned a spot on the Opening Day roster. The 22-year-old has never appeared in a game above the High-A level, though. The Phillies can potentially work out a trade with Arizona to keep him with the club, but if a deal can't be struck the Diamondbacks can claim him for a small fee. Carrera likely will be used as a late-inning option off the bench.